Rare sewing machine - Starley "Queen of Hearts" treadle1. Combinations don't come much more desirable than this! Smith & Starley's "Queen of Hearts" was produced during the 1870s. 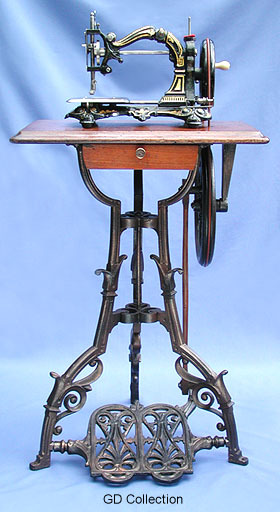 The machine is featured together with its ultra-rare dedicated treadle. The company was based at Trafalgar Works, Coventry, UK. For a close up of the machine head, click here.